For everyone who has ever come unstuck over ribbon or has hesitated to hand over a lovingly chosen gift because of its disastrous packaging, help is at hand. 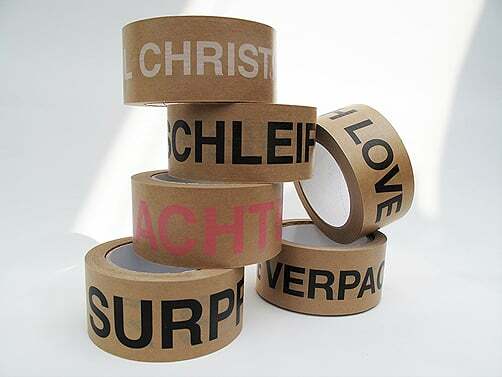 As not everyone is Christo and ribbon may not even reflect their own personal taste, a new solution is at hand: PACKED WITH LOVE tape turns even the simplest gift wrapping into a winner! You will find examples on the Pictures page. Now even gift wrap grouches and ribbon haters can wrap their presents simply and cleanly! The paper version with synthetic rubber adhesive costs €7.90. Back in 1995, a jewellery box designed by me won first prize in the packaging category of the Innovation Awards. I was given the award by a lady with a distinctive pudding bowl haircut – none other than our former Federal Environment Minister and up-to-date Federal Chancellor Angela Merkel! PACKED WITH LOVE tape needs no prize to impress, just its low price. From now on I sell my tapes at Etsy only. Jason Lanzoni and 22.367 people worldwide think my tape is fancy. Thank you all! There are some similar tapes by some people 'inspired' by my tapes. My original tapes are brown, and they are available at Etsy. Ask for special reseller conditions!